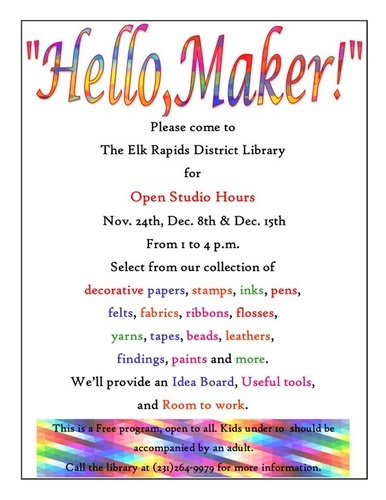 The Elk Rapids District Library will host an open makers space on multiple Saturdays during the holiday season, with a smorgasbord of craft supplies and tools for the public to use to make gifts or just have fun being creative. This is a FREE event and all ages are welcome, but kids under 10 must be accompanied by an adult. 11/24/2018 1 - 4 p.m.